Liverpool's owners should avoid knee-jerk reactions to a disappointing season, says the club's former chief executive Rick Parry. A 1-0 defeat at struggling Hull means the Reds are unlikely to qualify for the Champions League next season. They will also finish without a major trophy for the third straight season. "You have to stay strong. You've got to stick to your principles and not be blown this way and that," said Parry, chief executive at Anfield until 2009. "By last season's standards, this season's been a little bit disappointing. "Then again, two domestic cup semi-finals and still technically in contention for a Champions League place is not a million miles away." "Coming hard on the heels of a dismal performance in defeat by Aston Villa in the FA Cup semi-final at Wembley, another late-season collapse has left manager Brendan Rodgers facing serious questions. "Read more from BBC Sport's chief football writer here. Appointed Kenny Dalglish's replacement in 2012, Brendan Rodgers is the first Liverpool manager in more than half a century not to win a trophy in his first three full seasons at the club. The 42-year-old Northern Irishman, who took the Reds to the brink of the Premier League title last season only to lose out to Manchester City, believes he is still the right man to take the club forward. He also insists the club's American owners, Fenway Sports Group, will support him with marquee signings this summer. 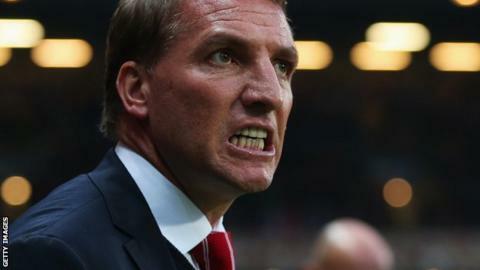 Speaking at The Sporting Directors' Summit in Manchester, Parry defended Rodgers. He said: "You don't go from zero to hero overnight and you don't go from hero to zero overnight. "But at a club like Liverpool, the weight of expectation, from the fans and the ownership in terms of delivering and winning trophies, is very high."